In drafts of ILSR’s forthcoming report on a distributed generation future (check back June 22! ), I took some flak for my solar PV economies of scale analysis. 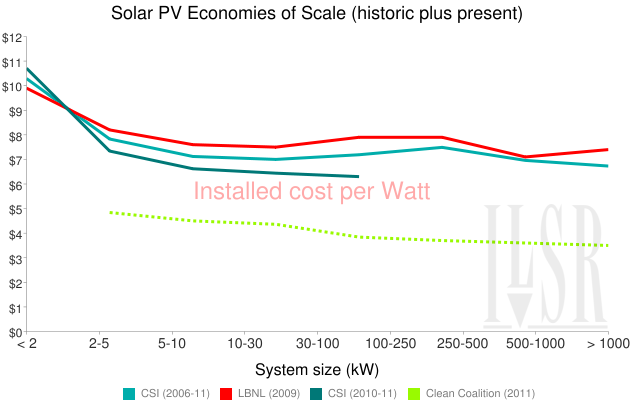 In it, I used data from the California Solar Initiative (through 2009) to point out that most economies of scale in solar PV seem to be captured at a size of 10 kilowatts (a large residential-scale project). “The solar statements seem way off base,” wrote one reviewer. Upon further review, I stand by my initial claim. But, I note that the critics have a point, as well. The historic data confirms my earlier analysis, that most economies of scale are achieved at small size. In the full CSI database, there’s a 23% decrease in per Watt cost when increasing project size from under 2 kW to 5-10 kW, but only a further 6% percentage point decrease in sizing up to over 1,000 kW. The other two curves are quite similar. But the historic U.S. data is not the only story. In the Clean Coalition data, the savings from 5 kW to 25 kW are about 10%, but the savings from upsizing to 100 kW are a cumulative 21%, and growing to 1,000 kW offers a total of 28% off the 5 kW price per Watt. In other words, economies of scale continue strongly through the 100 kW size range. Their data is not alone. In the German feed-in tariff, solar PV producers are paid a fixed price per kWh generated, with prices set according to the location of the solar PV plant (roof/ground) and by size (small, medium, large, etc). Overall, Germany is simply cheaper, with average installed costs for 10-100 kW rooftop PV installations of just $3.70 per Watt. But their economies of scale are also strong: there is a 10% price differential between rooftop solar arrays smaller than 30 kW and those 100-1000 kW, but an additional 15% price drop for projects over 1000 kW. The conclusion is murky. Historical data in the U.S. supports my original assertion: economies of scale for solar PV are limited beyond 10 kW. But recent installed cost data and the German experience both suggest that there are stronger economies of scale up to projects 1,000 kW (1 MW) in size. John– I am a business analyst who could use the data from “Solar PV Economies of Scale (historic and present)” for a few of my clients. Can you email that data to me? Real data all packed in one page! Have you considered a CSP overlay of data?